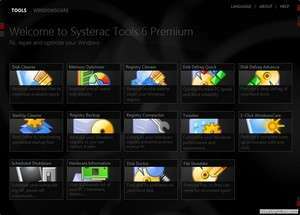 Systerac Tools present 14 valuable tools that help you tweak your Windows Vista for optimum performance. With the touch of a button you will be able to immediately identify any problems and weak points and correct them with the safety that only Systerac can guarrantee. 13 great tools for Windows Vista that will improve your PC performance, speed up your programs and Internet connection, diagnose pc problems and tweak your PC for optimal results. For security reasons, you should also check out the Systerac Tools download at LO4D.com which includes virus and malware tests. Additional screenshots of this application download may be available, too.